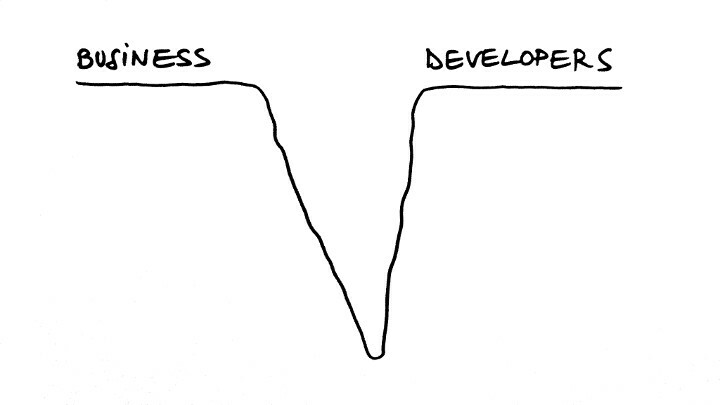 Developers are generally great people who love working on hard problems. They enjoy learning new things and finding elegant technical solutions for each task they work on. Business people love it when they see new deals being struck, increasing margins and market share. Between these two sides, there's a chasm. Your business needs to cross it unless you want elegant technical solutions to problems nobody has or a backlog the size of a Dostoevski novel. This can lead to working with state-of-the-art technologies that are not suited for your needs. It can also lead to great pieces of code that are of no use to your customers or stakeholders. Actionable advice: either start learning about programming languages/frameworks and how to write concise user stories and use cases OR get a Technical Product Manager to do the hard work for you. Most of the time, such a consultant is only required a few hours per week and can drastically increase your feature to code ratio.